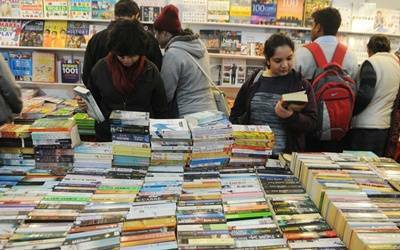 New Delhi, Jan 11 (IANS) Publishing stalwarts might be drawing huge crowds at the World Book Fair, but giving them some competition are stalls and stands offering books for just Rs 100. "The sale has been good till now and we are seeing a rise in sale of books compared to last year. More than 100 copies are sold every day. On Sunday, we managed to sell around 250 copies," Pramod Kumar, who has his stand at Hall number 8, told IANS. Lung Shai, a second year student of Delhi College of Arts said that it is a better place than the weekly market at Daryaganj because "waking up on Sunday morning every week is not possible. Also, going there every time is not easy". "And why not to buy books when you can get them for Rs 100 or Rs 50. I can buy many books within my budget," beamed Shrestha Tiwary, a second year student of Shyam Lal College who picked up a copy of "Twilight". The "Twilight" saga appeared to be a favourite among buyers, E.L James’ "Fifty Shades of Grey" seemed to be in demand along with books written by John Grisham and Sidney Sheldon. Old classics like "Pride and Prejudice" and "Macbeth" were also seen being picked up. Arundhati Roy’s "The God of Small Things" also found a place in the list. "People often think that the books are second-hand or pirated, but these are original copies from abroad. Also, if we buy in bulk from publishers we get them at a lesser price, so we can sell them for less (than the marked price)," Deepak, another stand owner explained.